But on Tuesday, Knight chose a different path than his father and uncle when he gave a verbal commitment to Rob Koll and the Cornell Big Red. Knight chose Cornell over Iowa State, Minnesota, Wisconsin, and Arizona State. He projects collegiately at 184 pounds. Knight is a two-time Iowa Class 3A state champion and three-time state finalist. As a freshman, Knight finished runner-up at 152 pounds. He claimed the 160-pound state title as a sophomore. Last season, as a junior, Knight moved up two weight classes and won the state title at 189 pounds. 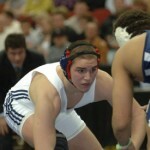 He was a Cadet Nationals freestyle All-American in 2007. Steve Knight and Rob Koll trained together at Team Foxcatcher in the early 90’s and developed a lasting friendship. Knight says that his father, who has national and international success both as a wrestler and coach, was instrumental during the recruiting process. Cornell is on the brink of landing one of the nation’s top recruiting classes. Knight, who is ranked as the No. 50 recruit in the country, becomes the fourth InterMat Top 100 recruit from the Class of 2010 to give a verbal commitment to Cornell, joining No. 3 Chris Villalonga (Blair Academy, NJ), No. 4 Marshall Peppelman (Central Dauphin, PA), and No. 99 Jesse Shanaman (Blair Academy, NJ). Knight credits much of his wrestling success to Excel Wrestling, a nationally-renowned program operated by his father. Knight’s goals for his final season of high school wrestling are to be an undefeated state champion, making the FILA Junior World Team, and win a Junior Nationals title in Fargo. As for college and beyond, Knight has high aspirations and believes that he will be in the perfect environment in accomplish his goals on and off the mat. not bad…looks like Cornell is landing a great freshman class for next year. How do they land all these non-NY recruits?